Our primary business is the dismantling of tractor and combines obtained on auction and private purchase, to which we dedicate over 30 years experience. 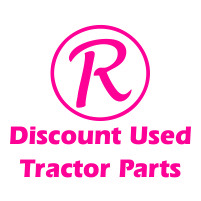 Discount Used Tractor Parts And Implements is a family business that was established in the mid 1980′s. The company is based in Delmas, Mpumalanga, RSA and supply farm machinery and parts all over Africa straight from the factory to the farmer. We have a larger selection of quality used and new farming equipment. Discount Used Tractor Parts was established in Delmas, Mpumalanga in 1985 and since then we have gone from strength to strength. Our primary business is the dismantling of tractor and combines obtained on auction and private purchase, to which we dedicate over 30 years experience. We are the largest spare parts factory in Africa, supplying new, and rebuilt parts for tractors and combines through a network of plus or minus 190 co-op branches. Through our large network of overseas suppliers a large variety of imports makes our range comprehensive. All of our parts, including reconditioned items, are thoroughly checked and made ready for same day service. Our off the shelf system allows reduced downtime which in turn saves our clients money. In short we are supplying a quality product off the shelf at the best possible price!